I've found that I've been doing a lot more late-season cycling this year than I have in the past, but only under certain conditions. What shapes my decision making is educational when it comes to understanding what makes cycling appealing to more people year-round. The question of year-round cycling, or even full three-season cycling, is one I wonder about a lot, and written about before. Generally speaking, I don't cycle in winter. There are exceptions, including one trip to Vincenzo's on a sunny, sharply cold day (I ended up taking some paper napkins to line the holes in my helmet because I'd got the windchill equivalent of an ice cream headache.) Or the time I biked to uptown during an incredible January thaw and ended up getting my bike's brake and gear lines wet, and therefore frozen solid for the rest of the winter. What I've learned is I have two major impediments to winter cycling-- and neither of them are temperature. The biggest single impediment is light (or lack thereof.) The second biggest is biking on snow and ice. Studded tires can go a long way to making small amounts of snow and ice tolerable, but I don't have them because once the time change sets in at the start of November, I'm no longer willing to tolerate cycling home on Lexington Road in the dark, so I haven't invested in them. This trip is about half the length of my work commute, and often in the evening. A bike commute makes the trip about 20 minutes on my terms, whereas transit takes 30-40 minutes and with poor frequency in the late evenings or on Sunday, especially when I'm trying to get home. And if the car's available, a trip to campus has to contend with paying for parking. I've also found that cycling to work, and then using GRT bus bike racks to get me and my steed to the UW area for evening commitments, to be a viable option. So the bike has made a lot of sense, even as the weather gets colder and sunset gets earlier. The trip is simple, and pleasant-- side streets through the Mary-Allen neighbourhood and Uptown, then up through Waterloo Park. There are good bike racks both on campus (though theft is common there) and at the Granite (custom-built bike racks in the outline of curling rocks!) Even at 9:30pm last night, with temperatures around freezing and a chill wind, I'm finding the ride to be pleasant and comfortable. The lesson here is that cycling conditions and trip length really affect my willingness to hop on the bike, regardless of the amount of light. A 4km bike ride through Uptown and on trails on a freezing November night is tolerable (even pleasant) but a 9km bike ride knowing I have to survive the Lexington Road expressway crossing is not. The length itself is not such a big deal, but the combination of that major barrier and the conditions of Hillside Trail are deal-breakers. Of course, this is all quite temporary. It's November, and soon the snows will be here. Even my shorter evening trips will become untenable: the Waterloo Park trail will be a rutted, icy mess in between infrequent clearings, and can't be relied on. It will be the barrier that hangs my bike up for the winter. Which brings us back to the same old same old when it comes to encouraging people to bike: we need a comfortable environment to cycle in. But everyone has their own particular "deal-breakers". I will tolerate cycling on Lexington Road until it crosses a perceived-risk threshold when the after-work commute gets too dark. Others view it as a year-round deal-breaker. For trips without that kind of major barrier, some will happily jump on the bike but only while weather is warm. Others might bike year-round except for the lack of winter trail maintenance. A hardy few will tough through anything. Each little improvement we make to the cycling network enables a few more trips for a few more people. Just looking at my usual trip corridor, the Hillside Trail paving will be one less barrier to those whose bikes (or backs, or wrists) can't handle the rough loose surface. Finally providing bike infrastructure across the expressway at Lexington would allow an entire neighbourhood to connect to the rest of the city. Examples of this kind of barrier removal opportunity can be found city-wide. They all build on each other. And the role of transit in providing support to someone's travels by bike shouldn't be underestimated. Whether it's a flat tire, surprise inclement weather or a change in plans, a bike rack on the front of a GRT bus or within an ION light rail vehicle gives people confidence they'll be able to get through their day without a car, even if the unexpected strikes. And this is the way we shift travel mode share. An improvement at a time, a few people at a time, and individually, as we learn what we are capable of, where, and when... without being tethered to an automobile. I recently read about protests against plans to pave the trail surface in Hillside Park, and I am disappointed. While the residents of Ferndale Place raise a legitimate concern about how city staff notified people about upcoming work, the complaints that a few unhappy citizens are bringing forward just don't make sense. One complaint is that upgrading the trail surface will ruin this park as a natural gem. As a daily user of the park, I can attest that the park is a beautiful natural oasis, but less than two years ago it was a muddy construction zone filled with heavy earth moving equipment. If the park can survive a sewer replacement, it can withstand a paved trail. 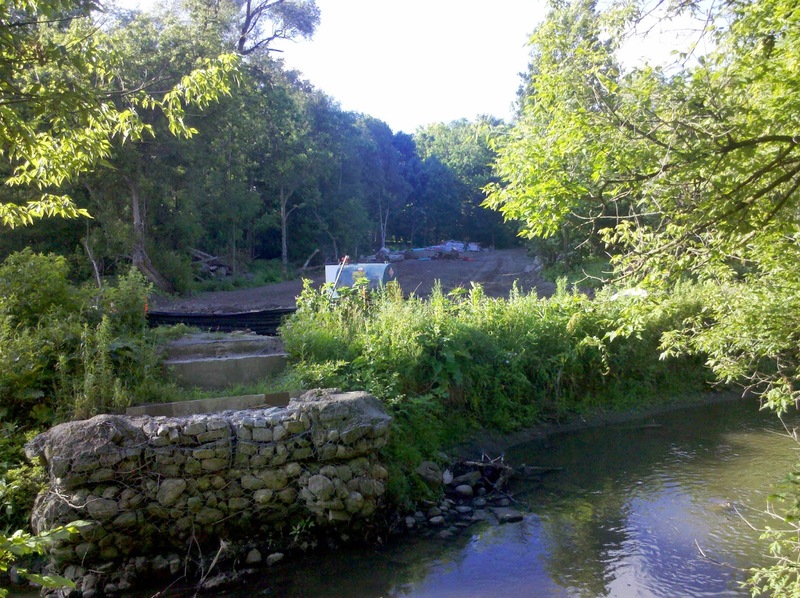 Sewer reconstruction in Hillside Park: where were protesters then? Furthermore, worries about "environmental damage" completely ignore the current reality. 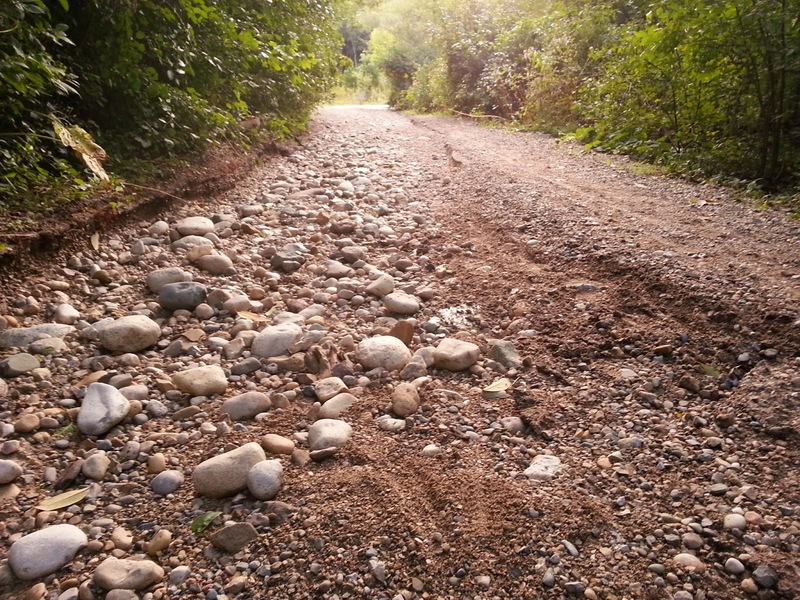 I saw gravel trails washed out by stormwater three times in 2014 alone, and countless times before. After each incident, heavy vehicles truck in tons of new stone and sand to repair dangerous washouts that are sometimes a foot deep. With each new storm, this material is spread into meadows and silts up the creek. A hard trail surface will permanently solve this problem and prevent injuries. Storm runoff gouged this gravel trail down to the foundation layer in 2014. 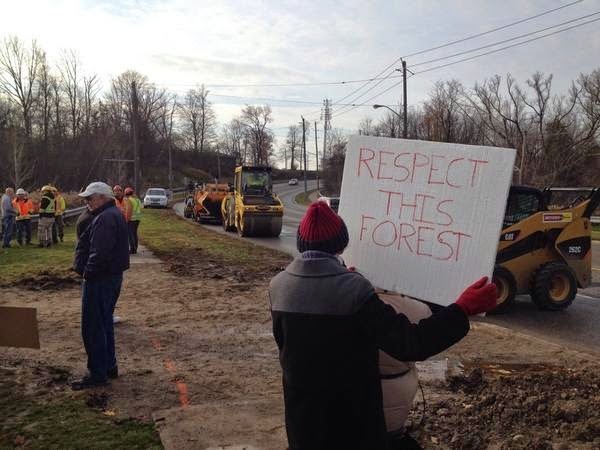 What is lost in these protesters' message is how Hillside Park's degraded, loose gravel trails make it inaccessible to many in our community. Paving the trails will improve accessibility for all: in wheelchair or mobility scooter, with stroller, as well as on bike or on foot. Virtually every other city park provides paved trails without diminishing the natural environment, including Forwell Creek Park which directly connects to Hillside, so that they are not a barrier to those of us who struggle with mobility challenges. The concerns of a few residents who don't want any changes need to be weighed against the needs of everyone. Accessibility must trump aesthetics. Hillside Park is a public space, not a private backyard.